Given names occupy a rather specialized semantic status. While the vast majority of given names are, in ultimate origin, derived from or identical to ordinary words in the language and culture of their birth, the semantic value of a given name is not identical to the ordinary word – even in cases where the two are identifiably connected, for example the modern given name Heather and the plant heather – instead, when a word, or a complex formed of words, becomes used as a given name, its semantic status switches to being a designator or label for a person. If this happens often enough, the name can become wholly divorced from the original word, as happens when a word becomes fixed as a name and continues to exist and be used even when the culture of its origin is lost or wholly changed. William remains a meaningful label even in contexts where no one knows that it is derived from Old German willo ‘will’ + helm ‘helmet’. A strange consequence of this unique semantic status is that given names are routinely omitted from contexts which otherwise strive to provide comprehensive semantic information: Namely, dictionaries. Given names are for the most part systematically excluded from lexicons (exceptions occurring when the given name has re-entered the word pool as a common term, such as ‘guy’ and ‘jill’ as generic terms for a man or a woman). When considering lexicons designed with a primary goal of simply giving semantic information, this exclusion makes sense; because of this relevant way in which given names differ from ordinary words in their semantic content, there isn’t a sensible way to include them. The situation is different, though, when we turn to lexicons that seek to give historical accounts of languages. Recently there has been significant interest in compiling historical word dictionaries of various medieval languages, cf., e.g., the Middle English Dictionary, various dictionaries of Old French such as those found here, the Dictionary of Medieval Latin from British Sources, the Dictionary of Medieval Latin from Celtic Sources, the Anglo-Norman Dictionary, the Dictionary of the Scots Language, the Dictionnaire Étymologique de l’Ancien Français, etc., and even the Oxford English Dictionary. But none of these include given names, except incidentally, and in these contexts, this lacuna becomes more problematic, as no complete picture can be given of a language that doesn’t take into account given names, how they are spelled, and how they are used. 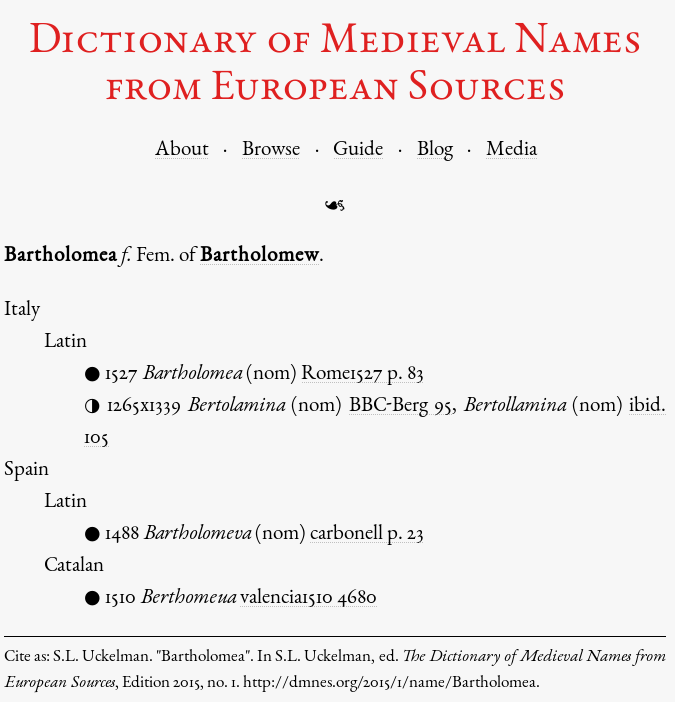 Given names are especially important in the study of vernaculars from periods in which virtually all documentary material is in Latin; because they are often lightly Latinized, given names can provide evidence for regional and dialectal differences which are otherwise obscured by linguistic corpora that focus purely on non-given name words. The Dictionary of Medieval Names from European Sources was created in part to help fill this lacuna. Headed up by Dr. Sara L. Uckelman of the Institute for Medieval and Early Modern Studies at Durham University along with an international team involving people in England, Ireland, Norway, Hungary, Iceland, and Australia, the Dictionary is a project to collect, collate, and identify all given names in European sources between 600 and 1600. The first edition, just published, contains over 20,000 citations of over 1,000 different names. New editions will be published on a quarterly basis, each extending the previous with both new entries and new citations in previous entries. Each entry contains etymological and linguistic information; information concerning important people who bore the name (rulers, ecclesiastical leaders, and saints), as this often influenced the use of the name among ordinary people; and other relevant information such as connections with other names, information drawn from other sources, discussion of spelling variants and diminutive forms, etc. Dictionaries of given names, even ones including historical information, are not new; but with almost no exception, the ones of historical and linguistic merit are specialized to a single language. One thing that the Dictionary provides which is different from any other more specialized project is the ability to easily compare the use of a name across different times, cultures, and languages, to see how the names (and the languages in which they occur) evolve (providing linguistically interesting information) as well as how names spread geographically over time (providing sociological data not otherwise easily available in any form). A project on such a scale as this can only succeed by taking advantage of the collective knowledge that the Internet makes accessible, and we on the DMNES team have many plans to do that. Already, engagement with other onomasts and medievalists via social media (find us on Facebook; follow us on twitter, read our blog) has helped solve a few puzzles, and a future feature that we are excited to roll out is a regular “Do you know this name?” question wherein we provide information about names that we have examples of that we cannot yet identify and solicit help from the masses. The focus on on-line publication, instead of print (though we are considering a print version, perhaps on a yearly basis), allows us to continually work to augment the data without having to wait for the project to be “big enough” to be worthwhile. A project like this is likely to be decades, if not a century or more, in the making, and we are excited to extend our knowledge of medieval names and naming practices at every step of the way.